Jair Bolsonaro said the words investors wanted to hear. Brazil’s next president pledged to trim the deficit, pay down debt and reduce the size of government after results showed him cruising to victory over Fernando Haddad of the left-wing Workers’ Party. An American depository receipt of Petroleo Brasileiro SA trading in Germany rose as much as 6.1 per cent, while an exchange-traded fund focused on Brazilian stocks soared Tokyo trading, climbing 11 per cent in the first post-vote verdict from traders. 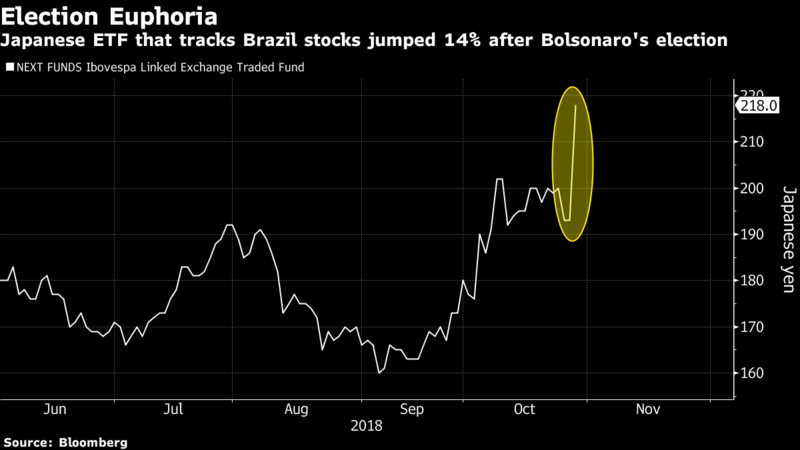 Brazilian assets are already the world’s best performers since polls in mid-September showed the conservative lawmaker and former army captain ascending in polls. The comments from Bolsonaro should tamp down on any skepticism that he wasn’t fully committed to pension and tax overhauls -- which lingered since the candidate himself often professed an ignorance when it came to economics -- pleasing investors who had abandoned Latin America’s largest economy over the past several years as fiscal accounts deteriorated. He sees the Ibovespa stock index soaring more than 50 per cent to 130,000 by the middle of next year, and predicts the real will climb 21 per cent in the same span to 3 per dollar. He’s not alone in the optimism. UBS Group AG, after months of skepticism on Brazil’s stocks, is now telling investors that under the right circumstances the Ibovespa could rally almost 40 per cent over just the next two months. Banco Bradesco SA and Citigroup Inc. have both predicted surges, and investors from Schroders Plc to NCH Capital are adding to their Brazilian holdings. The Ibovespa has surged 29 per cent in dollar terms over the past six weeks, with the real jumping 15 per cent, both posting the best performances globally. Part of investors’ giddiness is simply that the Workers’ Party, known as the PT for its initials in Portuguese, won’t be returning to power. Much of the business community blames Brazil’s leftest politicians for corruption and years of economic mismanagement, culminating in the country’s worse recession in a century and the loss of its investment-grade credit rating. The top priority for most investors is an overhaul of the pension system, which is broadly seen as too expensive to sustain. Changes such as setting a minimum retirement age could go a long way to shoring up fiscal accounts, though they’re likely to meet some resistance among Brazilians who don’t want to give up benefits they believe they’re entitled to. Bolsonaro got 55 per cent of the vote to Haddad’s 45 per cent with almost all votes counted. Bolsonaro focused much of his campaign on a tough-on-crime pledge that some observers saw as having racial overtones, and his disparaging comments about women and homosexuals have contributed to a high rejection rate among Brazilians -- about 45 per cent. Adding to his potential difficulties when he takes office Jan. 1 in a fractious congress with more than a dozen political parties also seeking to prioritize their pet projects. In his victory speech, Bolsonaro pledged to heal divisions and govern for all Brazilians. For now, investors are giving him the benefit of the doubt and cheering on his pledges to fortify the economy.